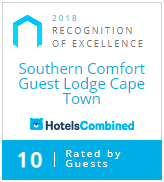 Southern Comfort Guest Lodge is situated in the heart of Cape Town nestled on the slopes of Table Mountain. Stay in any of our 4 upmarket rooms, each with modern en-suite bathroom featuring a glass walk in shower and a private patio leading to the terrace garden. Enjoy the swimming pool and large rooftop viewing deck where you will experience a majestic 360 degree view of Table Mountain, Lion’s Head, Devil’s Peak and the Mother City. Each of our upmarket rooms feature a modern en-suite bathroom with glass walk-in shower and a private patio leading onto a terrace garden. Enjoy the sparkling pool and soak up the sun from a pool lounger. We offer a number of services to make your stay a comfortable and enjoyable experience. Any special requests that you require, please do not hesitate to let us know and we will do our best to accomodate you. Here we have a little taster of what you can expect when staying with us at Southern Comfort Guest Lodge. Rest in our upmarket rooms, relax next to our sparkling pool and take in the panoramic views of Table Mountain, Lion’s Head, Devil’s Peak and Cape Town City Bowl from the rooftop viewing deck.